Do you often find yourself feeling a very strong need to switch to a new eCommerce platform? You are not alone! To help businesses like yours understand if it is time for you to switch to a new eCommerce platform we have compiled a checklist, which has been gathered over the years considering inputs from multiple clients and taking cues from multiple implementations, for your reference. Wiring with your new eCommerce platform may be hard but it definitely possesses the capability to turn the tables. Your sales can multiply and can jolt up the customer experience. But, it is worth to know the right time to switch your eCommerce platform. E-commerce industry is witnessing a flurry of activities and technology supporting it is changing by the minute; it is an evolving industry. However, there are certain novel eCommerce platforms that are more up-to-the-minute on prevailing trends than others. To exemplify, Magento is on the forefront of Responsive Design – which is the capability for your website to display well on many different digital device types. This will become a must-have feature very soon – so if your current platform doesn’t support this, it is time to switch to a new eCommerce platform. My current platform won’t integrate with important third party systems like an ERP or Order fulfillment system. 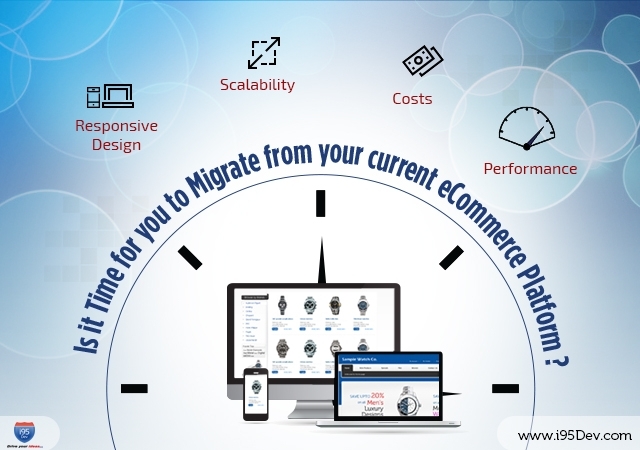 Automation and integration can save your company a lot of dollars – and if you current eCommerce platform cannot support that it is a brilliant reason to switch to a new eCommerce platform, such as Magento, that integrates with most third party systems quite seamlessly. There are multiple vendors which offer integration tools for platforms like Microsoft Dynamics ERP, SAP, EPICOR, etc. Read more about Magento integration with Microsoft Dynamics GP, Microsoft Dynamics AX and Microsoft Dynamics NAV. My hosted cart has a lot performance issues. It is sensible to possess the ability to control who your host is, what kind of performance enhancements can be executed on your eCommerce site and server, as well as maneuver over downtime issues; these issues can cost your company a lot money. It is very difficult and expensive to find resources add new features. If you more often than not find yourself looking for resources to help you manage your eCommerce store and it is very time consuming and resource intensive job to add new features then it is time to migrate a new eCommerce store that will help you do these activities easily. With Magento its vibrant developer community you can very easily find an extension that meets your requirement. You current platform bills you a percentage of sales, which right now is more than the annual Magento licensing fees.A single-server annual Magento license (Enterprise Edition) has a price tag of around $18k. If you are giving more than this as commissions to your existing platform then you are paying overly. Also pay attention if you are paying up in commissions on phone and other types of orders that you manually enter; this expense could be truncated by paying a flat annual licensing cost. Moreover there is Magento Community Edition, which is powerful for most basic eCommerce businesses, and has no licensing fee at all.